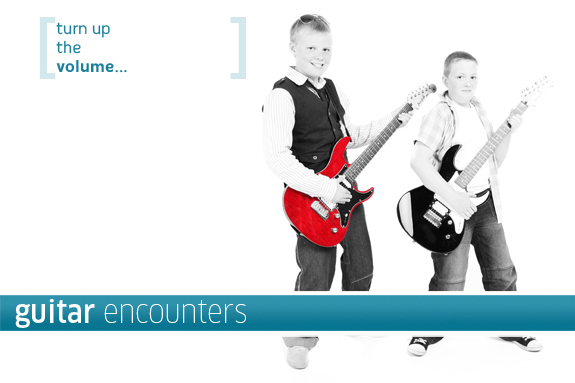 Guitar Encounters is a rock and pop-based course. Perfectly suited to any aspiring guitarist from the age of 8 upwards, lessons are taught on electric and electric-acoustic instruments. Classes contain typically 6 to 8 students so there is always a chance for you to play as group to complement your solo work. Not only does the course material cover skills and techniques that would make other guitarists green with envy, it is also fully accredited by Rock School meaning that you can take exams from Grade 1 to Grade 8 standard. From Grade 6 and above examination results also count towards your UCAS entry points. Each lesson consists of six or seven different activities, covering a wide range of techniques. You’ll get the opportunity to play solo and with the rest of the class. A CD provided with each book contains great backing tracks to make your practise lots of fun. You will learn performance, theory, technical and aural skills. Both left-hand playing (chord playing, melody playing, slides, bends, muting, hammer-on) and right hand (plectrum, finger-style, slap, dynamic control) performance techniques are covered. This is complemented by a through training in music and guitar-specific theory where you will become familiar with both staff notation and tablature. You will gain an understanding of different musical keys, chords, scales and modes, and their relationship to each other. As you progress you will learn how to provide chords to accompany a melody and vice versa eventually leading to listening to and transcribing music and even arranging songs in different musical styles. Guitar Encounters also provides a wealth of technical training. You’ll become familiar with tuning and maintenance techniques and how strings, tone controls, amplifier settings and guitar type can re-create the sounds of your Guitar legends.